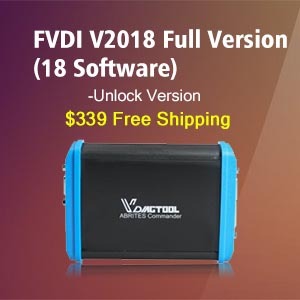 This article show a step-by-step guide on how to update and active Autek IKey820 car key programmer & code reader. 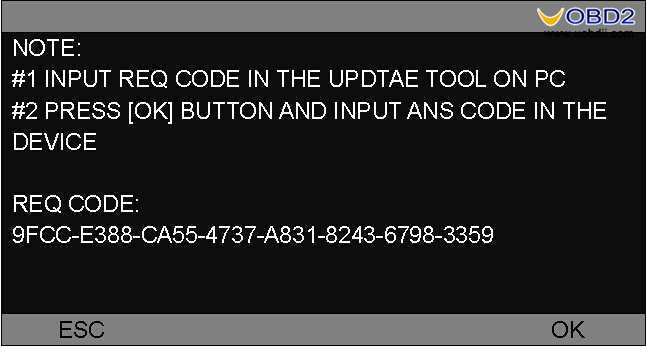 If the update tool “AUTEK IKEY 820 Update Tool V1.2 is already installed on your PC before, just skip this chapter. If not, you need to install it. 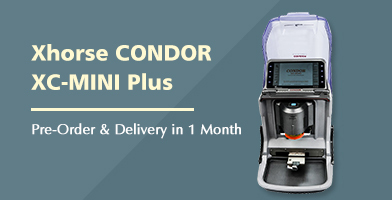 If you do not have the setup file, please ask your distributor for it. Click ‘Next’ until the finish window, and click finish button to end the install program. There will be a shortcut icon on the desktop. 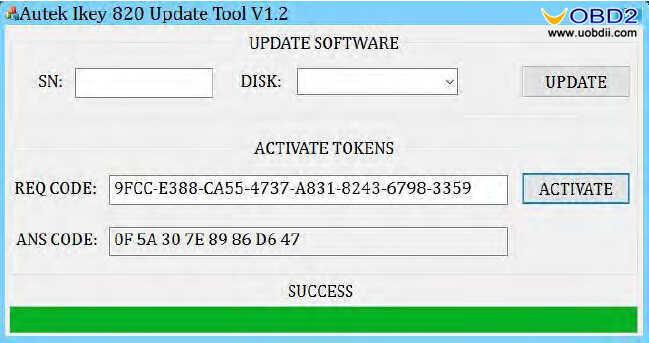 AUTEK IKEY 820 Update Tool contains three parts including UPDATE, ACTIVATE and MESSAGE from top to bottom. 4) Click UPDATE button to start updating, wait until the updating completed. There is something you need to notice in each step. 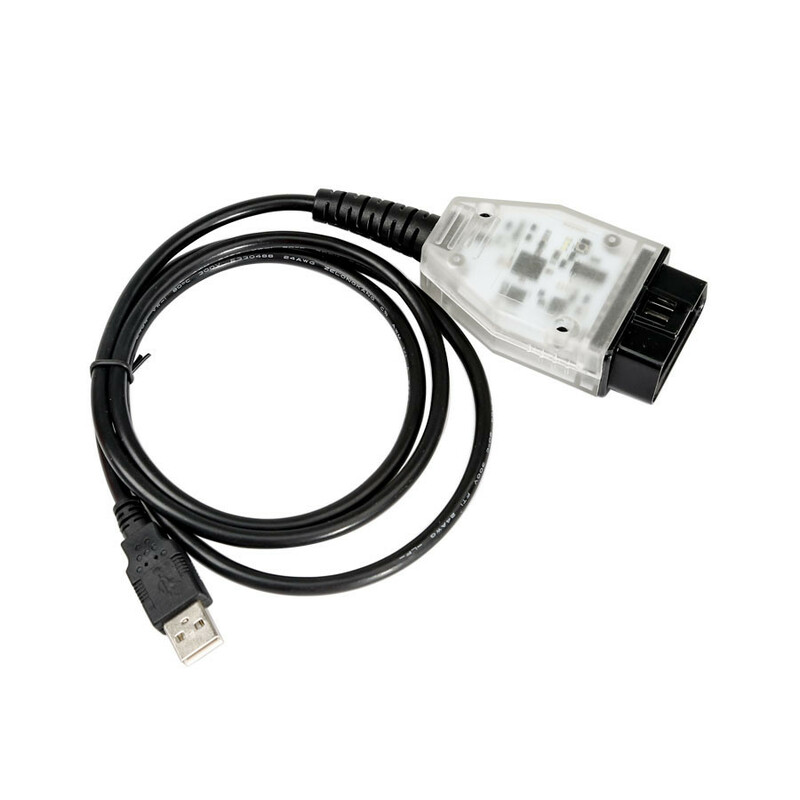 1) The device should display “USB SD DISK MODE” when connected to PC through USB cable, if not, please unplug the USB cable and plug again. Do not unplug the USB cable or exit from USB SD DISK MODE. 2) If AUTEK IKEY 820 Update Tool is not installed, please install it first, see detail in chapter 2. 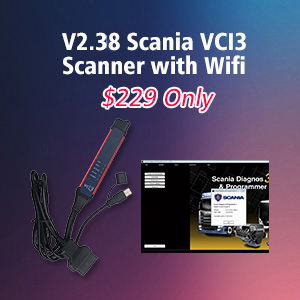 3) The DISK and SN should display automatically if the device is connected to PC. If the DISK has no device to select, please unplug the USB cable and plug again. If the DISK has been selected, but SN is empty, please unplug the USB cable and plug again. If it’s still the same, please input SN yourself. The SN should start with “A-”. 4) It may take several minutes to update, it depends on the speed of your internet. If there is any problem, it will display on message area, check according to the message and try again. Here are the pages for updating. The SN is just an example, you should use your own SN. Activation means add tokens to your device. 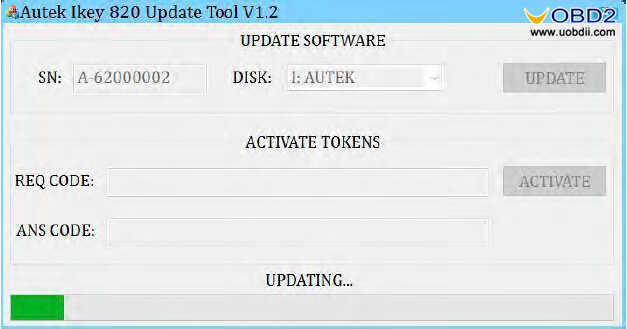 If your device runs out of tokens or you want to increase the number of tokens, you can use AUTEK IKEY 820 Update Tool to increase tokens. 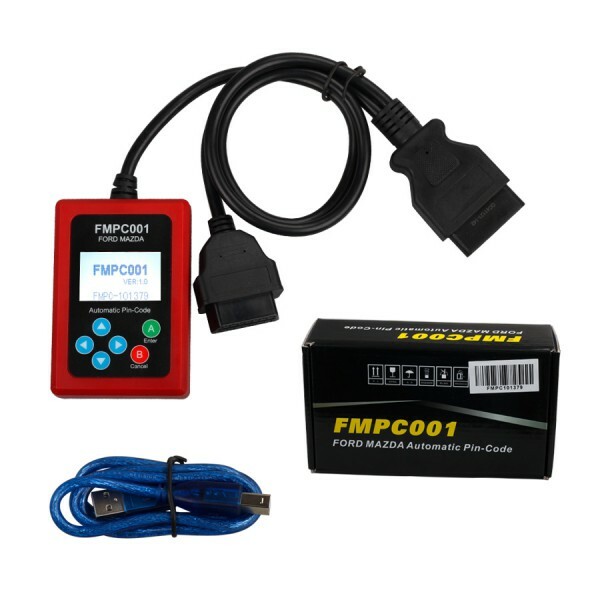 1) Supply power to the AUTEK IKEY 820 device through USB/12V DC adapter/OBD. 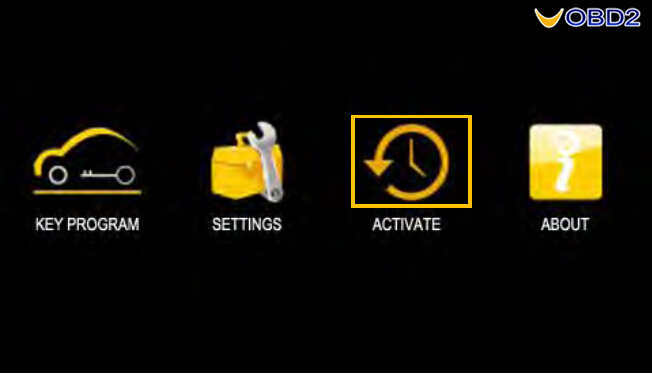 2) Go to the ACTIVATE menu, you will see a page with steps to activate your device and the REQ CODE which is need in AUTEK IKEY 820 Update Tool to get the ANS CODE. 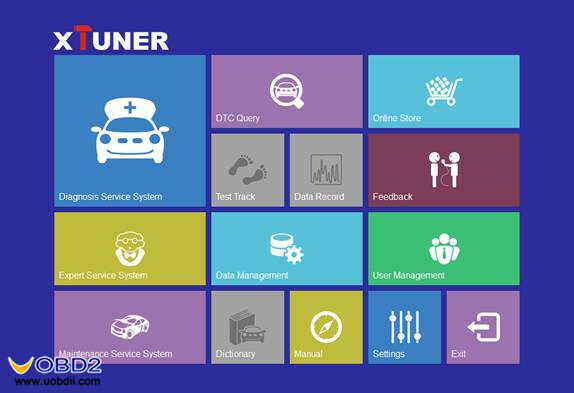 3) Open AUTEK IKEY 820 Update Tool in your PC. 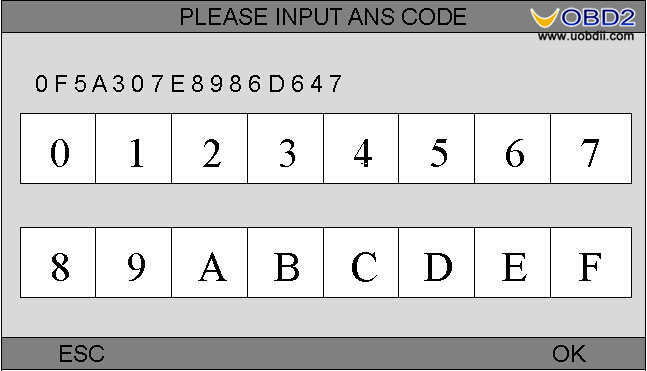 5) Press OK button on the device and there display the page to input ANS CODE. 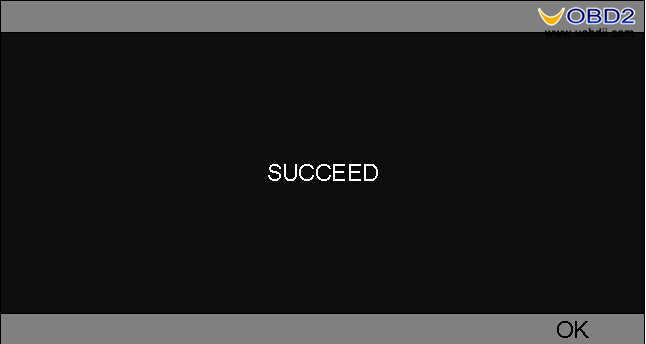 7) Press OK button and the page will show the result, SUCCESS or FAILED. 8) You can check your tokens in the ABOUT menu if you activate your device successfully. Here are the pictures to activate the device. 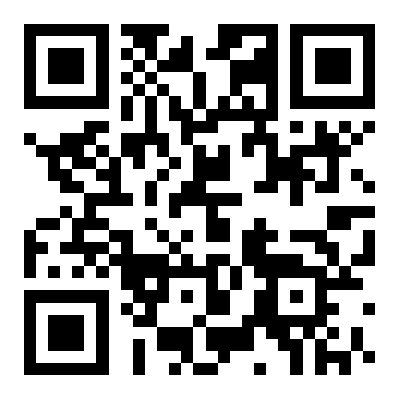 All the SN、REQ CODE and ANS CODE are examples, just ignore them.